Much modern, small-scale gold mining is conducted on claims staked under authority of the Mining Law. In August 2015, one of the West’s thousands of old, inactive metal mines made national headlines—and not in a good way. 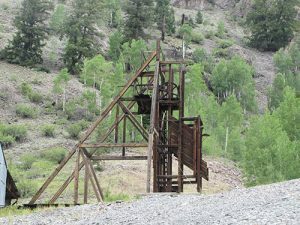 At Silverton, Colorado, the Gold King mine, a long-inactive, hardrock mine that originated with claims staked in the 1880s, “blew out” and sent million of gallons of polluted water into 300 miles of downstream creeks and rivers. This flow of discolored water—highly acidic and loaded with toxic metals—was another example of mine-drainage pollution, one of the major environmental consequences of frontier-era mining. The highly publicized Gold King blowout focused widespread attention on a bill that had, coincidentally, just been introduced to the United States House of Representatives, H.R.963, which was passed into law as the Hardrock Mining Reform and Reclamation Act of 2015 (114th Congress). This bill was the latest in a string of unsuccessful attempts to rewrite the General Mining Act of 1872. 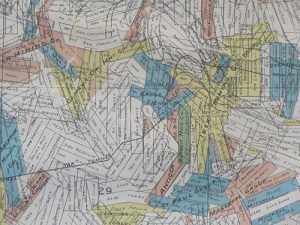 Many frontier-era mining-district maps show the locations of thousands of mining claims. Familiarly known as the Mining Law, this federal legislation grants citizens the right to stake mineral claims on public land. H.R.963 proposed revising the Mining Law by imposing mineral-production and environmental-reclamation levies on mining operations, and eliminating its claim-patenting provision. The last half century has seen many legislative attempts to modify or repeal the 145-year-old Mining Law; H.R.963 (114th Congress) was the third try in the last eight years. But even though the Gold King blowout generated unusually strong support from environmentalists, the bill received no action in committee and died with the end of the congressional session in January 2017. The Mining Law is one of the most controversial and polarizing pieces of federal legislation ever enacted. If you doubt this, just bring up the subject in conversation, particularly in the West where public-land mining is a major industry and prospectors still stake thousands of claims each year. You’ll hear the Mining Law defended as a time-honored manifestation of the American frontier spirit and a foundation of the modern West’s mining economy. You’ll also hear it attacked as a costly, archaic law that is contrary to today’s concepts of environmental protection and public land use. Many misconceptions surround the Mining Law, and one of the biggest is that it exists today as originally written. While its basic procedures for staking and recording claims are essentially unchanged, the law’s scope and authority have been radically diminished over the years. Another common misconception regarding the Mining Law is that its importance died with the frontier. In truth, however, the Mining Law continues to heavily impact the use of public land in the West. The Bureau of Land Management (BLM), which administers the national mineral-claiming system, currently lists 370,000 valid claims covering 10,000 square miles, an area roughly equal to that of the state of Vermont. Furthermore, the BLM has recorded 9,000 new claims in just the past 18 months. As for the law’s current economic impact, unpatented mineral claims are the foundation of Nevada’s gold-mining boom, which has yielded 200 million troy ounces of gold since the 1980s and created, directly or indirectly, tens of thousands of high-paying jobs. Despite its contemporary economic relevance, the Mining Law is clearly a product of the frontier era, with roots that go back even further to the old Spanish laws that regulated mining during the colonial era. 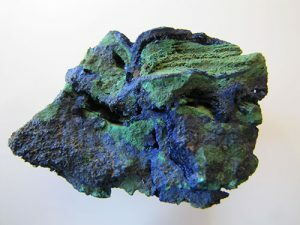 Arizona’s Morenci mine, which was staked in the 1870s, is still producing oxidized copper ore today. regulating the coming gold rush. To fill the resulting legal vacuum, California miners quickly (and happily) established their own regulations. Today’s Mining Law took shape amid the economic chaos that followed the Civil War. Mired in debt and facing huge Reconstruction costs, the federal government saw its vast Western lands as the key to revitalizing the national economy. The West then consisted almost entirely of “public domain”: federally owned land that was not assigned, administered or regulated. To accelerate the settlement and development of the West, Congress began making this land available to citizens through the Homestead Act of 1862, four Pacific Railroad acts, and the General Mining Act of 1872. The government’s first step in regulating public-land mining was the Lode Mining Act of 1866, which formalized the right of individuals to claim federal land for lode-mining purposes. The subsequent Placer Act of 1870 addressed the claiming of placer deposits. The General Mining Act of 1872, formally described as “An Act to Promote the Development of the Mining Resources of the United States”, combined elements of the California gold-rush experience and the earlier mining acts with several new concepts. Among the latter was a patenting provision that enabled claimants, after meeting certain requirements and paying nominal fees, to take full title to their claimed land. The law also confirmed the government’s “free-mineral” policy: Unlike other nations that taxed mineral production, the United States had no intention of imposing a royalty. The new law defined five steps in the claiming process: discovery, location, recordation, maintenance and patenting. 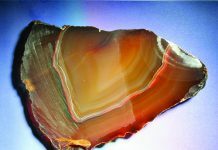 Discovery refers to the finding of valuable mineral deposits, which initially included all mineral resources. Location is the physical “staking”, or marking, of claims, while recordation is the filing of claims with designated agencies. Maintenance is the requirement to conduct mining operations or improvement (assessment) work; patenting is the procedure through which claimants can take full title to their claims. 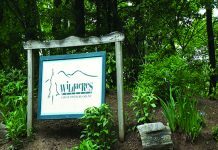 The law recognized two types of claims: placers had a variable-dimension area of 20 acres and were intended for use along gold-bearing watercourses; and lodes measured 1,500 feet by 600 feet and were intended for hardrock mining. Although claims could be recorded without cost, the Mining Law initially imposed an annual assessment of $100, a substantial sum in 1872. Claimants could also fulfill the assessment requirement by mining or by performing “improvement” work that was “incident to mining”. The government did nothing to confirm the validity of mineral discoveries or the performance of mining or improvement work. But failure to register assessments meant that claims would be considered abandoned and thus eligible to be staked by others. But because the Mining Law’s regulations were rarely enforced, Western court dockets ended up filled with criminal and civil charges of claim-jumping and related offenses. Only when claimants applied for patents did federal agents confirm mineral discovery and assessment compliance. Claimants were not required to actually mine their claims, but simply to prove that they were “valuable”, a vague term that the government quasi-defined in 1894 in its “prudent-man” ruling: A claim was “valuable” if a person of “ordinary prudence” was justified in expending his labor and means to develop a mine. After demonstrating “value” and paying a $5 fee for each lode claim and $2.50 for each placer claim, claimants could take full title to the land and its minerals. 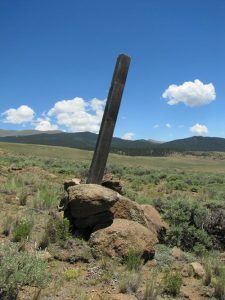 This center marker of a lode claim, erected in 1921, is still standing today. The Mining Law was an extraordinarily effective piece of legislation that more than fulfilled its intent. By 1900, it had encouraged hundreds of thousands of men and women to risk their time, effort, resources, and sometimes even their lives to search for minerals on the public domain. They staked more than a million claims, helped to settle the West, and made the term “stake a claim” an enduring part of the American vernacular, with meanings that now extend far beyond its original mining context. Most of these claims produced nothing at all; a much smaller number were, at best, marginally successful. But the smallest group of all—perhaps only 1 percent of all the recorded claims—had enormous social and economic impacts. These were developed into mines and mining districts that attracted railroads and new settlers, spawned towns and cities, and eventually produced billions of dollars in mineral resources that helped transform the United States into an industrial nation and an international economic power. Unfortunately, the Mining Law’s lack of regulation encouraged rampant abuse. Claimants patented vast tracts of land with no intention of mining, while dishonest federal agents accepted bribes to patent claims, whether they were valuable or not. And speculators rushed to mineral strikes to stake adjacent land, not because of mineral discoveries, but simply because that land was likely to appreciate in value. During the 20th century, the Mining Law underwent many statutory changes. In its original form, prospectors could claim 1 million square miles of public domain. Today, more than half that land has been withdrawn from the law’s jurisdiction through state land grants and the establishment of national parks and monuments, Indian reservations, military areas, and wilderness, scenic and research preserves. The law’s original list of claimable mineral resources has also been sharply reduced, sometimes as the result of claiming scandals. During World War I, a national liquid-fuel shortage turned attention to the West’s oil-shale deposits. Because vast areas of bedrock consisted of nothing but oil shale, speculators quickly staked 30,000 lode claims covering 7,000 square miles. Although little shale oil was ever produced, claimants patented hundreds of square miles of public land. Amid public outrage over this “land giveaway”, Congress, realizing that certain mineral resources should not be claimable, passed the Mineral Leasing Act of 1920, withdrawing oil shale, natural gas, petroleum, trona, potash, phosphate rock, and similar resources from Mining Law jurisdiction. Such resources could now only be leased from the government, which retained land ownership and collected production royalties. Following World War II, when the government desperately needed domestic sources of uranium for national-defense purposes, the Mining Law proved invaluable. Attracted by the law’s claiming provisions and additional federal financial incentives, prospectors surged into Utah, Colorado, Wyoming, and New Mexico, staking thousands of claims and discovering rich deposits that quickly made the nation self-sufficient in uranium. The Mining Law was modified again in 1955, when Congress withdrew sand and gravel, building stone, limestone, pumice, volcanic cinder, and clay from claiming, designating them as “saleable” on a contract-tonnage basis. An estimated 250,000 inactive mines, scattered across the Western states, were staked under Mining Law authority. Air and Clean Water acts in the early 1970s. The Federal Land Policy and Management Act of 1976 further restricted mining activity on unpatented claims by imposing regulations “to prevent unnecessary or undue degradation of public lands”. 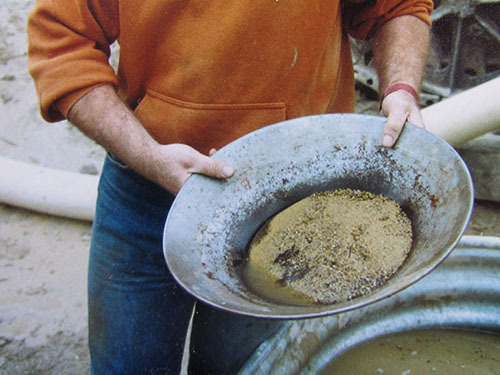 During the 1960s, prospectors had staked only about 20,000 claims each year, but amid soaring, free-market gold prices of the late 1970s, they staked more than 160,000 new claims annually, almost all for gold. Most were speculative and were later cancelled due to failure to register assessments. By the time the Mining Law turned 120 years old in 1992, some 3.2 million acres—roughly 5,000 square miles—of mineral claims had been patented into private ownership. Aware of the many thousands of new gold claims still being recorded, and anxious to avoid another land-giveaway scandal, Congress imposed a claim-patenting moratorium in 1994. This moratorium remains in effect today. Despite the Mining Law’s many modifications, its critics continue to demand additional reforms with proposals ranging from minor tinkering to major revisions. Some even advocate repealing the law entirely and canceling all existing unpatented claims—an approach that is generating much public and congressional opposition in the West. H.R.963 (114th Congress) took a middle-of-the-road approach that focused on what most critics consider the law’s two major flaws: its lack of a royalty provision and its failure to address environmental concerns. The Mining Law was never intended to generate revenue; in fact, imposing a mineral-production royalty in 1872 would have been contrary to the law’s intended purpose. But had the law included a royalty provision, it would have put billions of dollars into federal coffers over the decades, and would continue to do so today. Regarding the royalty issue, H.R.963 (114th Congress) proposed an 8% royalty on gross mineral production for all new mines (4% for existing mines). But while generating government revenue, this royalty would likely have deterred new-mine development, shut down certain marginal mining operations, discouraged mineral exploration, increased mining unemployment, and generally weakened the West’s mining economy. When enacted, the Mining Law perfectly reflected the nation’s existing land-use mentality; because Western land then seemed to be an inexhaustible resource, matters of environmental protection and mine abandonment were of no concern. When mines closed, miners simply walked away without regard for the consequences. As a result, some 250,000 abandoned mines now contribute to the current mine-drainage-pollution problem that will cost as much as $54 billion to remediate. With environmental remediation in mind, H.R.963 (114th Congress) called for establishment of a Hardrock Mineral Fund that would have imposed a seven-cent reclamation fee on every ton of material that mines displaced. For a medium-size, modern open-pit mine that moved 100 million tons of material, this reclamation fee would have amounted to $7 million over the life of the mine. These funds would have been earmarked for reclaiming and restoring land and water resources impacted by early mining, with Colorado’s Gold King mine being a good example. In opposing this bill, the mining industry noted that the existing, free-mineral policy only partially compensates for its high state and federal environmental-compliance costs. The industry also contended that mineral-production and environmental taxes would further weaken its ability to compete in global mineral markets, while increasing America’s dependency upon foreign minerals and thus compromising national security and economic growth. As expected, critics disagreed, branding the free-mineral policy as nothing more than an unfair federal subsidy of the mining industry that costs the government dearly in lost revenues. Interestingly, H.R.963 (114th Congress) would have exempted small-scale miners with annual mineral-production incomes of under $100,000 from both royalties and environmental fees. Although H.R.963 (114th Congress) never made it into law, other bills to reform the Mining Law are already being drafted. Should a new bill become law, it will affect not only mining companies, but also individuals and small groups. The latter would include amateur prospectors, gem-and-mineral clubs, commercial mineral-specimen collectors, and recreational and small-scale miners who hold claims for everything from placer gold and aquamarine to smoky quartz, sapphires, amazonite, peridot, topaz and garnet. Should the Mining Law be rewritten in the future, it should not affect recreational rockhounds. 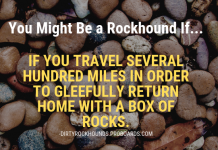 While the basic right to collect minerals on public lands without charge or encumbrance originates with the Mining Law, the specific legality for rockhounding rests in the United States Code of Federal Regulations (CFR). 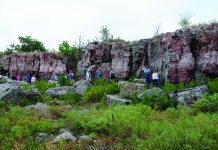 While stating the requirements for locating minerals under the Mining Law, CFR Title 43 exempts “individuals desiring to search for and occasionally remove small mineral samples or specimens”, providing that these specimens are “for personal, noncommercial use; no mechanical equipment is employed; no significant surface disturbance results; and collection does not interfere with existing permits, leases, claims, sales, or private rights”. In 2015, opponents of the Mining Law had believed that the Gold King mine blowout would finally rally enough public and congressional support to pass H.R.963 (114th Congress), but when it comes to major restructuring, the Mining Law seems to have an uncanny ability to defy its critics. In his 1991 book Staking a Claim! (Westernlore Press), author Charles Wallace Miller Jr. gives one reason for the Mining Law’s remarkable longevity. He believes that the law embodies many positive elements of the American frontier experience, including outdoor adventure, risk-taking, and the comforting idea that vast public lands still await exploration and thus represent unlimited opportunity for the “rugged individual”. 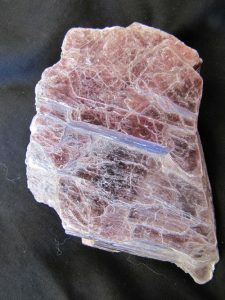 This specimen of lepidolite, a lithium-bearing, mica-group mineral, was mined on claims staked under authority of the Mining Law. objective political, environmental or economic perspectives. He sees it as something of a “sacred cow”, an untouchable psychological link to the frontier. And so the law’s longevity, endurance, and public support are attributable, at least in part, to a reluctance to finally close the door on the frontier ethic. And that may be true, since many amateur prospectors, gold panners, and mineral collectors would likely agree that their field experiences are enriched just by knowing that if they do make a mineral discovery on public land, they can still stake a claim. So when the next bill to revise or repeal the General Mining Act of 1872 is introduced to Congress, be sure to direct your comments, pro or con, to your congressional representatives.